When I was very young, the first meal I prepared was a remarkable recipe called “boef a la mode” from Julia Child’s Mastering the Art of French Cooking. Tasting it while it was braising, I could tell it was special, and when I served it, everyone raved over the sensational taste. The beef was exceedingly tender and flavourful, and the sauce was divine. But somewhere along the way I lost that book and never made the dish again. 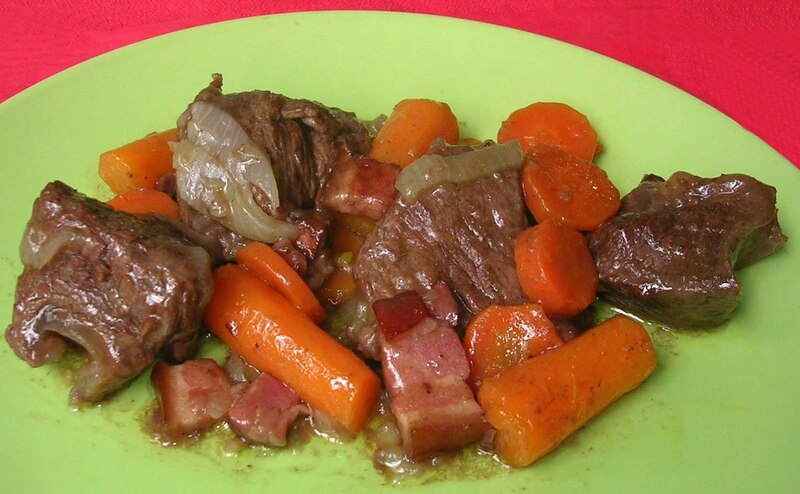 Recently, I am talking about food with a good cook, and the talk turns to pot roast. My mom used to make a pot roast when I was a child, and I remember she used a stale end chunk of rye bread in it to help thicken it. My friend and I agreed that using bones makes a wonderful unctuous broth, but he says last time he had no bones and tried a packet of gelatin in its place to good success. I want to try that. I decide to prepare boef a la mode again, this time sans bones. Judging from my BW’s reaction, it is something to behold. Since it’s something I want all to taste, I’m writing it all down here. With all due respect to the exalted Miss Child, here is how I do it. 1 bunch parsley- set aside a small handful of leaves and mince them. Take the meat and separate it into two halves where the muscle is. You can almost pull it apart barehanded, or use a paring knife to aid you. You can trim off any excess fat now. Season each half all over with salt and put into a colander over a flat pan for one hour at room temperature. Reduce the wine over medium flame to 2 cups, takes about 10 minutes. Tie parsley, thyme and bay leaves or encase in a metal tea ball, if big enough. Pre-heat oven to 300F (150C) and put rack in lower third. Dry surface of beef with paper towel and lightly sprinkle ground black pepper all over. Get 6 lengths of kitchen string and tie 3 around each piece of beef. Cook bacon in skillet till crisp. Remove, drain and crumple. Keep skillet nearby. Put 3 tablespoons of bacon fat in a Dutch oven over high flame. When very hot, brown the beef thoroughly on all sides. Take your time because this is important. As each piece is well browned, remove to a platter. Lower flame to medium and add the onion, stirring now and again until softened. Then add the garlic, flour and crumpled bacon pieces. Stir for about a minute, and then add the concentrated wine, beef broth, herbs and peppercorns. Scrape the pan with spatula to loosen bottom. Put platter of beef plus juices on platter into the Dutch oven. Turn flame up and bring to simmer. Put the cover on; make sure it is not loose. Put the Dutch oven in the oven. Set your timer. Each hour (set timer for 1 hour 3 times) turn meat over in the Dutch oven (carefully- use tongs or two spatulas). For last hour, add carrots and turnips. There should be plenty of liquid in pot, if necessary add water. Meanwhile, Put onions, butter, sugar and ½ cup water in that skillet, turn flame high. Cover skillet, turn heat down and cook 5 minutes. Uncover, raise flame and cook until liquid is boiled off. Add the mushrooms, a pinch of salt and cook stirring often until vegetables are browned, about 10 minutes. Remove from stove. Sprinkle the gelatin powder into ¼ cup cold water. When beef is done, put in platter again to rest. Use the foil to cover it loosely. Let braising liquid cool off. Skim off any excess fat. Take out the herbs bundle and put in onion mixture. Simmer until thickened over medium flame for about 20 minutes. You should have a lot of sauce. Taste and perhaps add a little salt and pepper. Add the gelatin and stir thoroughly. After beef has sat awhile and cooled off remove string and slice. This dish is a couple hundred years old, but still good. It is not an everyday dish, but once in awhile… as a special dish… hey, it’s good groceries.